The second lowest price, $2.14/gallon, happened in 2016 following another oil price collapse. That same collapse had also impacted the price of $2.31/gallon in 2015, the third lowest price on the chart. President Obama was in office at that time. This year’s price of $2.33/gallon is the fourth lowest on the graphic. However, I would acknowledge that President Trump probably had more impact on this price than Bush or Obama had on the other low prices. Nevertheless, if we return to President Trump’s tweet and the question of whether it’s just luck that gasoline prices are low — I think it’s clear that sometimes it is just luck. 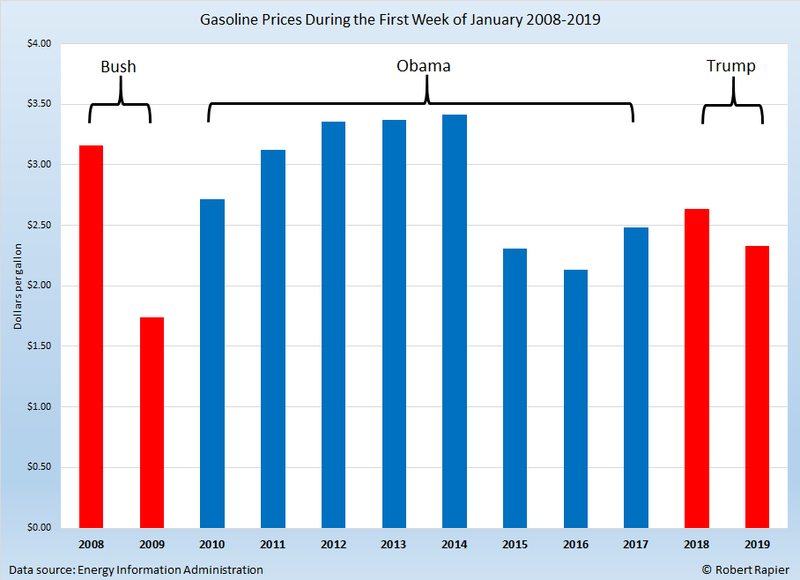 President Bush’s energy policies weren’t responsible for gasoline prices being below $2/gallon in 2009. Nor did President Obama’s energy policies cause gasoline prices to fall in 2015 and 2016. But the jury is still out as to whether President Trump’s impact will be more than fleeting. The short-term benefit of lower gas prices came at a cost. Saudi Arabia is already reducing oil production and pushing oil prices higher. It is doubtful they will be as compliant when it comes to future requests that they pump more oil.